A Place in Mound: What if you don't have a car? What if you don't have a car? Improving connectivity is a top priority in Mound. We have engineered and designed our lives so that getting to the store, a friends house, work or school, is best and most easily done by automobile. If you attempt to go anywhere in Mound on it's streets via walking, bus, or bicycle, you will quickly realize serious problems many people have to live with everyday. Cars on our streets tend to go much faster than the posted speed limits. It's very difficult to enjoy a pleasant walk in your neighborhood while a 1990's era black Ford Bronco goes barreling by you at 30+ miles per hour. Every time my children leaves for school, my heart skips a little beat when I think about them crossing Bartlett Blvd every day. Attempting to cross four lanes of traffic at County Road 15 and on Commerce Blvd on the Dakota Trail breaks out a sweat for everyone that is conscious of safety. I was talking with one regular Mound pedestrian and her walk everyday to work to a local business. She has to walk along Tuxedo Blvd for two miles most days of the year. There is a sidewalk along one side of Tuxedo, but it is in terrible shape, and growth from bushes and trees impede use of it. In the winter she has to walk alongside traffic, as the shoulders and sidewalk quickly fill up with snow removal. Walking towards Swenson Park on Brighton Blvd where people like my kids are not welcomed. Another woman I talked with regularly walks to the Mound Transit Center from the Island using Wilshire. The intersection of Wilshire and Brighton had been recently rebuilt, and we were discussing pedestrian safety in Mound. Her days would be ruined as she would be simply attempting to get to work or home, because cars were whizzing by dangerously close to her. The city of Mound spent considerable time in the last year discussing regulations determining how much car storage should certain types of businesses be required to build, but almost none about bike storage. There was considerable effort and time and money spent on the new Dakota Trail crossing on County Rd. 15, mostly aimed at stopping bikes, and changing the way they ride, instead of addressing how cars approach the intersection. The priority of today's street and road engineers is to build places where cars can travel unimpeded. My wife and I have worked hard to raise two independent children. My eight year old, Cecelia, now has the confidence and ability to go to bike to the Dollar+ store, piano lessons and friends houses in our neighborhood. 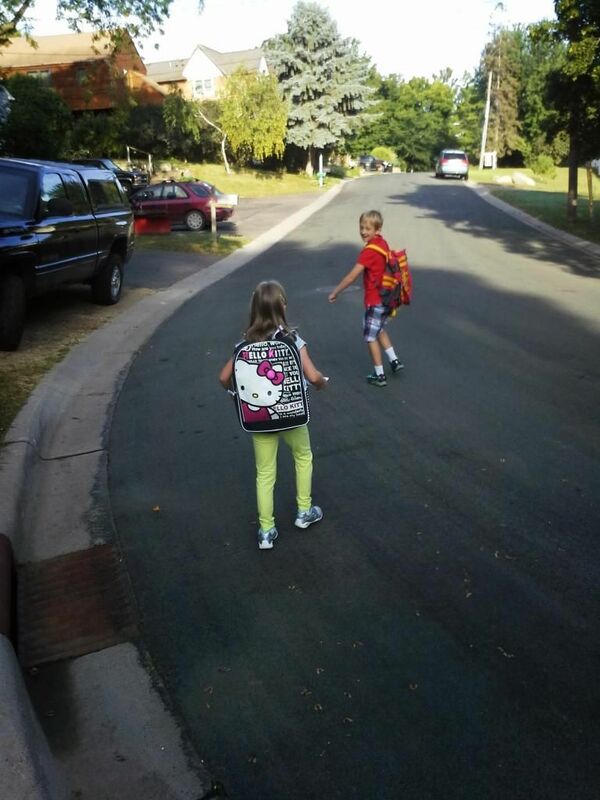 She and her sister, Maeve, walk nearly every day to school. What's next for Cecelia? Will she be able to walk or bike to Swenson Park on her own? How about biking to the library, or to Grandview School, where she will go next year for school. Going to those places will mean traveling on the "Highways" of Mound that weren't built for people like them. Those places will be a bigger hurdle and I'm not confident Cecelia will be able to handle them for a couple more years. 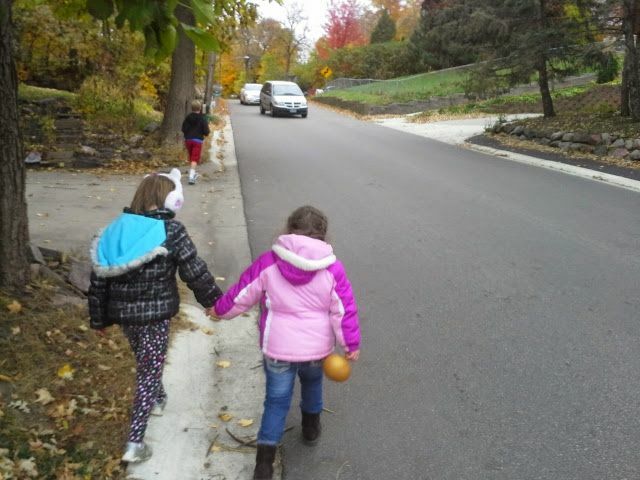 Cecelia and Maeve start off on their walk to school. What are the other options for people without cars? I dare you to ask anyone I work with at Sojourn about their Metro Mobility experiences. They are likely to tell you it's inconvenient, unreliable, and you have to plan your trip days in advance. There are Taxi and other services that are incredibly expensive. I have great respect for WeCab here in Mound, but I think it's irresponsible of my community to expect volunteers to shuttle people about town on errands. In 2012, it was found 1 in 12 households do no own a car, and that 13% of people 15 years and older don't drive a car. I believe Mound and all cities in general need to build these streets with these people in mind. It's not going to be easy, and there will be a lot of "experts" from Hennepin County, MNDoT telling us we can't build streets like that, but they would be wrong. Not only does building streets for people make our neighborhoods better, but then it encourages healthier lifestyles, and allows those without a use of a car, a safer, and more productive life. My daughters and I have enjoyed our neighborhood park visits this week. Please stop by and see me tonight at Belmont Park if you are around. Please like and share "A Place in Mound" on Facebook, and with your neighbors and friends in Mound, and vote for George Linkert on November 4th.
" Not only does building streets for people make our neighborhoods better, but then it encourages healthier lifestyles, and allows those without a use of a car, a safer, and more productive life. " That is true! Thank you for information! Car removals are fast and they can take off the junk car in the same day that they are contacted. Another advantage is that one receives cash for the wrecked car.